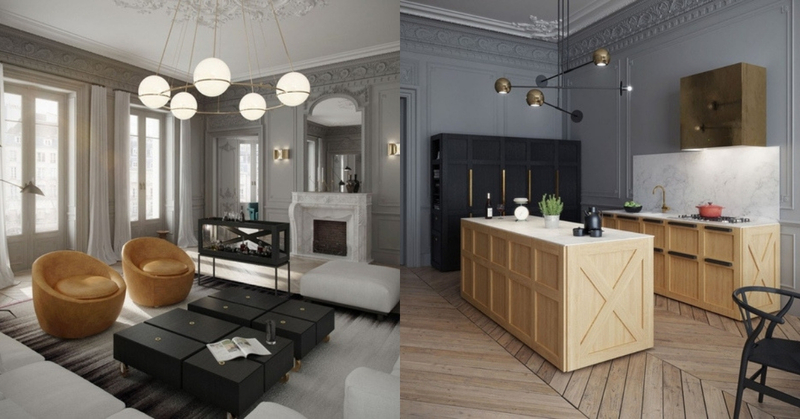 The French have amazing taste in design and fashion so it comes as no surprise that this Parisian apartment is laid out in such a beautiful style that makes us have serious house envy. However, it differs from the traditional classic style and adds a bit of modernity into its decor for a look that has us going crazy. The house is painted in soft grey on its walls and the designer, Art Buro has taken a rather industrial approach to its decor by using wooden planks on the kitchen floor in a herringbone pattern. The kitchen also uses wooden crates that have a rather rugged look but is toned down by the marble backsplash and futuristic chandelier. The living room is decked out in neutral colours but interestingly, you don’t really notice it much as Art Buro has chosen such unique and sophisticated decor it makes up for the lack of colour. One of the most exciting things about the living room is the bar which is made out of a fish tank and is easy to duplicate in your own home especially if you have an old fish tank lying around. However, the bedroom is jazzed up with bold pops of blue in its sleek decor that makes it look really elegant. The headboard grabs your attention with its blue pattern while the hidden desk in blue can be opened up when you need to do your work and folded neatly away when you’re ready for a good night’s sleep. It is interesting to note that the ceilings have elaborate carvings on them to give them a more glamorous look that meshes well with the rest of the more modern decor. This is definitely a home that we can see ourselves spending our days in style!